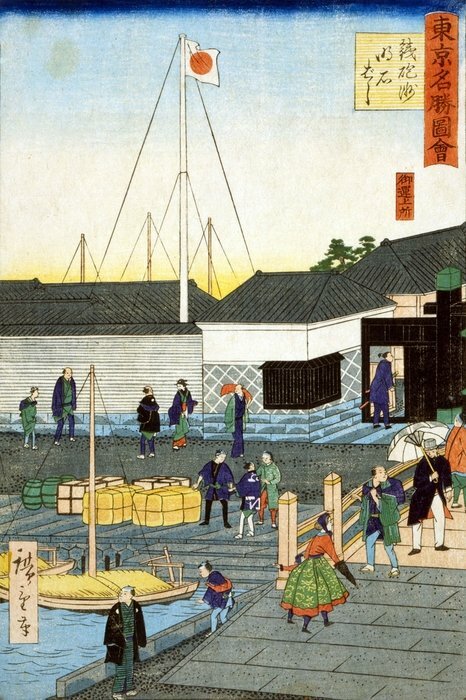 During the early 1700's trade in Japan was centered in Osaka. Approximately 10% of all wholesalers in the city worked in the rice exchange. At this time there were 9,000 private rice brokers and another 2,300 independent rice agents. There were also 481 official purveyors who purchased for the castles and the daimyo (lords). It is estimated that 10 million bushels of rice were traded each year in Osaka alone. Very little rice was eaten in Osaka. Most was shipped to Edo (Tokyo) for consumption. The rest was purchased by the ton'ya wholesalers and stored in warehouses in Osaka until the rice could be sold. The rice market in Osaka was located in Dojima, and that was what the entire rice trade was called. It is considered to be the very first commodities future markets in the world. At the time there were two types of rice. There was “true rice” which was rice that had been physically purchased and was stored locally in warehouses. It was called shomai. Paper rice was the other type of rice which was called choaimai. It was rice that was going to be delivered in the future. When the delivery date and price had been determined and recorded it could be sold, traded, or even used as collateral for a loan. The Japanese system of buying on margin meant that Japanese traders could purchased 10 to 15 times more rice as long as they completed the trade before the money was due. These long term trades result in a stable rice market. At this time smaller merchants who were called shonin (traveling salesmen) began buying agricultural products in agrarian areas and transporting them into the large cities where they sold them for a profit. Before long, the shonin were forced to unite into guilds for protection. This allowed them to trade their products on a national scale. Items that were traded nationally included perfume, textiles, spices, sugar, silk, iron tools, pottery, sake, charcoal, soy sauce, tofu, lamp oil, candles, pots and pans, gold, and silver. When the shonin traveled from town to town with their wares they usually stayed overnight in a temple or shine where the lodging was very cheap. At the same they usually ate at one of the cheap roadside stalls that served food. The bakafu (military government) controlled all foreign trade. They put the Japanese island of Tsushima in charge of trading with Korea. As a result Chinese currency began to filter into Japan. At this time Japanese cash came in the form of small round copper coins that were laced together through a square hole in the middle. A unit of cash was 100 of these coins on a string. However, there were other types of coinage that was accepted including 1 ounce silver coins that were equivalent to our dime. At this time, a 1 ounce gold coin was equal to 5 bushels of rice. In the large cities most of the shonin traded from a tiny shop that served as a place of business and a home. Very few shonin could afford their own separate home. However, almost all of them lived better than the peasants. These merchant shonin traded a wide varity of items including cotton, textiles, bamboo, pottery, silk, and indigo. Other city shonin purchased vegetables and fish in a central market and then hurried home to sell them before they spoiled because of the lack of refrigeration. One of the most unusual products that was traded on the open market was human excrement which was sold to farmers for fertilizer.